What do you do when your parent changes in some pretty significant ways? When the person you’ve always counted on embraces inconsistency? In a special episode of the StoryCorps podcast, we’re teaming up with Invisibilia to hear how a father and a daughter grapple with these questions. One of Invisibilia’s hosts, Lulu Miller, joins us to help explain how we told different parts of the same story. Bottom photo: Madison Mullen, who is currently a facilitator at StoryCorps, and Allie n Steve Mullen at their StoryCorps interview in New York City. Released on April 6, 2018. Michael Garofalo (MG): It’s the StoryCorps podcast from NPR, and in this episode, we’re doing something we’ve never done before. It’s sort of a crossover with Invisibilia, which is another NPR show, and we’ll be telling different parts of the same story. It’s about a father and a daughter, and how hard it can be to watch your parent change in some pretty significant ways. What do you do when the person you’ve always leaned on, you’ve always counted on to be consistent presence… what do you do when that person embraces inconsistency? Madison Mullen (MM): For 20 years I knew you as one thing and it’s taking me time to know you as something else. But that doesn’t mean that I don’t in some ways just really look up to the way that you are becoming the person you wanna be even if it’s six decades late. MG: Joining me is one of the hosts of Invisibilia, Lulu Miller, who will help me explain how a chance meeting in Chicago led to their part of the story, and to this very episode you’re listening to now. Lulu Miller (LM): I noticed this striking woman, she had like sort of short grey hair, really elegant. She looked like Glenn Close. MG: I’m Michael Garofalo. We’ll be right back after a short break. LM: So what is this strange word, Invisibilia? It is Latin for “invisible things,” and what we explore on the show are just the invisible things that are constantly shaping human behavior. So, something like beliefs, emotions, ideas. MG: And the episode we’re talking about here is called In-Between. It’s about the grey areas, about people who live in those places in various ways, people who are caught between two things – and what that means for their lives. And one of the people they feature in the show is somebody Lulu met while giving a talk in Chicago. MG: Lulu got to talking with this person, and they struck up an email correspondence. Lulu came to learn that her new pen pal was transgender and that they – that’s the pronoun we’re going to use to describe them – that they flipped back and forth between masculine and feminine. In fact, they sometimes went by the name Allie, and sometimes by the name they were given at birth: Steve. For the rest of the episode, though, we’ll call them Allie n Steve – that’s what’s on their work ID – Allie – the letter N – Steve. Allie N Steve. So one day Lulu gets an email from Allie n Steve that kind of takes Invisibilia to task for a story that they did. MG: The music in the episode, which was pretty sad, and the experts they talked to, all made it seem like living in between was a hard, scary thing. But for Allie n Steve, that hadn’t been their experience at all, and they felt like Lulu’s story didn’t account for the possibility that somebody could be happy this way. LM: And they said, “The window to wonder had been closed.” I – just that phrase, you closed the window on wonder? It was like oh, wow, we messed up. MG: So, Lulu decided to revisit the idea of living in-between genders, and to interview Allie n Steve for her story. MG: But there are two people who haven’t quite come to terms with Allie n Steve’s transition: their adult daughters. MG: And it’s complicated. They aren’t estranged, in fact they’re very close with their dad. They are caught in a grey area of their own. See, in other parts of their lives they support transgender people and rights, and the oldest daughter, whose name is Madison, is gay. But when it comes to seeing their dad change, it’s been really hard for them. So much so that they haven’t met their dad as a woman even though they’ve been out for seven years. Even today, Allie n Steve still dresses like a man when they see their daughters. And this is where StoryCorps comes into it. The oldest daughter, Madison, actually works here. She’s a facilitator – one of the people who records your story at our recording booths. 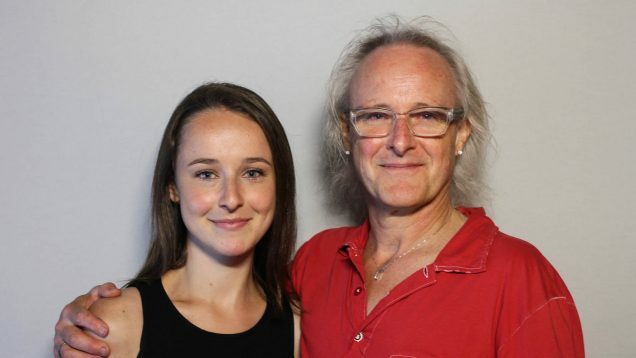 And she brought her dad to StoryCorps for an interview of their own. Allie N Steve Mullen (ASM): My name is Steve Mullen and I’m also known as Allie Stevens. And I’m going to be speaking with my daughter. Madison Mullen (MM): My name is Madison, or Maddie, Mullen and I’m talking to my dad. MG: This interview is where Lulu’s story on Invisiblia ends, and it’s where we’re going to pick it up in a StoryCorps recording booth in Lower Manhattan where Madison and her dad talk about their relationship, and why it’s been so hard for Madison to adjust. MM: When I first learned of any of this, I was a senior in high school. ASM: It’s one of the most memorable and single worst nights of my life. MM: Because mom had been hinting at it for years. ASM: I realized at that moment that we couldn’t not tell you anymore. ASM: First of all, I’m so sorry that I asked you what do you think. I was terrified. MM: I know you were. ASM: Do you remember what you said to me at a certain moment in that? ASM: Well, there’s a history of my not necessarily standing up to your mom, right? And you got after me that night. You said, “Why don’t you stand up for yourself? Oh, I get it. That’s not in your nature.” Which was a total slam on my not being man enough. But I thought, “Well, at least she’s pissed off, so I know she’s engaged.” Because I didn’t want to lose you guys. MM: Do you think you’ve lost us? ASM: No. No. No, in fact, I frankly feel closer to you because of it. Do you wish I had told you sooner? MM: I understand why you didn’t. But, I would’ve liked to know all of you growing up. And not have to feel like we’re playing catch-up. ASM: Yeah. At that time, I didn’t think of myself as transgender. In fact, I didn’t even know that word. I thought of myself as a transvestite, with all of the shame and embarrassment that that word calls to mind. And that was the image that I was always terrified of. That you would see me as pathetic. That you would see me as sad. That’s a lot of why I didn’t tell you. MM: That’s not the way I see you at all. I don’t view you as pathetic. In fact, I wish I had your outlook on life more. I think the way that you wake up, even if it’s irrationally optimistic, and say “today is gonna be the best day ever,” I do wanna be more like that. I just feel guilty though, because I know that you consider me when you get dressed in the morning. And I know that you consider me when you think about how you’re going to introduce yourself to people. Whether you’re gonna tell them your name is Steve or Allie. And I feel like I’m holding you back in a sense. ASM: No. It’s impossible for me to consider whether you’ve held me back or not. Because I’m not myself except in relation to you. That’s the starting point for me. The first thing in line, my first identity, is as your father. ASM: But that’s what parents do. It’s – It’s instinctive. MM: Yeah. At the end of the day I just can’t lose you as a dad. I do need you a lot, and I’m not sure if you knew that. ASM: Thank you for saying that, because my biggest goal has been to try to show you that no matter how I look, I’m always gonna be there for you. MM: And I know you’ve proven time and again that you are there. And I think that’s part of the scary thing, too. It’s, like, okay if I rely on this person so much, but then that person changes or that person doesn’t exist in some way anymore, what do I do? For 20 years I knew you as one thing and it’s taking me time to know you as something else. But that doesn’t mean that I don’t in some ways just really look up to the way that you are becoming the person you wanna be even it it’s six decades late. ASM: No, its not late. I don’t look at it as late. I don’t wish it had come earlier. I loved being your dad. I loved everything that it involved. But I love today. I love what’s happening in my life. And I would love for you to be able to see, when I’m my Allie-self, I feel like a bright light. And it will mean a tremendous amount to me when I’m able to share that with you. MG: That’s Allie n Steve Mullen speaking with their daughter, Madison. You know, unlike a lot of the stories we hear in StoryCorps interviews, where people are reflecting on something that happened in the past, the Mullens’ story is ongoing. They’re still in the middle of it. Since Lulu met and spoke with Allie n Steve and Madison after they recorded this StoryCorps interview, I asked her if she thought their relationship had progressed at all. LM: Yeah, but nothing like dramatic, no Hollywood ending, like it’s still in that in-between. Maddie is incredibly proud of her dad. She said this really interesting thing to me, I think this will answer the question best of where are they now. She just says, “I want to want to meet Allie. But I don’t know if I’m there yet.” So, like, she wants to. And knowing her, she’s gonna keep working on that. And I think that’s a beautiful place to be. MG: It’s funny, right, because like… what Allie n Steve does takes a lot of courage, and a lot of backbone. And then Madison talks a lot about being afraid, and about being uncertain but just the act of engaging around this stuff, she’s doing the thing that’s really hard for her. LM: I know! Like, oh you are being so brave. And I think very few people would be willing to admit how hard this is, and you see that their discomfort isn’t about a dad in a dress, it’s about their dad as not the person they thought that they were. And like it’s about their dad having these hidden sides, and I hope when people listen ultimately I think what you’ll hear is just this piece of – of utter love, like both sides kind of wading into territory that’s scary for them out of love. MG: Before we go, some listener voicemails. MG: Last week we brought you the story of the first girl to play little league baseball back in 1950, and I chatted with two girls who play today. MG: What position do you play? Reilly McCaffery (RM): I am a catcher. MG: Do you like playing catcher? RM: Yeah, it’s my favorite position. What’s your favorite position? MG: Well, I played second base. RM: Yeah, second base is pretty fun but catcher is just better. David Frack (DF): Hi, this is David Frack from Cary, North Carolina. I just listened to your podcast about Tubby, and it so much reminded me of my daughter. When she was about 7 years old we got her into a church baseball league. And the very first game that she played, the very first at-bat that she had, the coach on the other team saw her walking up to the plate and he yells out to the outfielders to, “Hey, come on in! It’s a girl!” So my daughter gets up to the plate and cracks this ball so far over the center fielder’s head that she could have rounded the bases twice by the time that kid caught up to the ball. So the next time at bat, this coach sees that my daughter is approaching the plate. He yells out to the outfield, “Hey, get back! It’s her!” [laughs] I just wanted to brag a little bit about my daughter. Thanks. Matthew Kenna (MK): Hi, my name is Matthew Kenna, and I’m calling from Seattle, Washington. I am a new father, I have a 6-month-old baby girl named Ayla. I’m a big baseball fan, and whether she wants to play baseball, basketball, football, or wants to be President of the United States, it’s a reminder that, as a parent, that I need to push her to do anything that she wants to do, and give her all the tools and resources to be able to do that. And if one day I have a boy, it’s also a reminder to me to make sure that I raise a son that knows to respect women and that they should be allowed to play baseball, basketball, football or Monopoly. So, just wanted to say thank you to those three women, you’re really inspirational and I loved hearing your message. MG: If there’s ever someone you hear on this show and you want to leave a message for them, the number to call is 301 744 TALK that’s 301 744 T-A-L-K.
And that’s all for this episode. Special thanks to Lulu Miller for joining us. Check out her story about Madison and her dad on Invisibilia. It’s out now in the episode called In-Between. Their StoryCorps conversation was produced by me and Von Diaz. This episode of the podcast was produced by David Herman and edited by me. Find out what music we used on our website StoryCorps-dot-org. And please keep those ratings and reviews coming – we really do read them all.